This basically works like a cooling gel pillow commonly found in department stores. When a laptop is placed atop the pad, the gel inside would absorb the heat and it will continue to do so until it warms up to equalize with the temperature of laptop’s underside. This means such a passive cooling method might not be ideal for bringing down temperature for a powerhouse laptop. Thanko improvises by adding a pump that circulates water through a plastic tube running across different sections of the cooling gel pad. Ideally, this should further improve cooling performance. The USB-powered pump reportedly has a discharge rate of 28L per hour. In Thanko’s own words, the cooler can lower the laptop chassis’ temperature from 39C to about 28C in less than 10 minutes. This notebook stand may not be much to look at, but it packs a water cooling system. You heard it right… water cooling. A USB-powered pump sitting under the stand circulates water through copper a radiator in mounted over a fan. The water flow is constantly wicking away heat from the copper radiator and any air that passes through it is cooled. This unique cooler should provide a significant increase in cooling over conventional fan-based cooling pad. It’s definitely something for those with gaming laptops for people serious about heavy multitasking. Water cooled systems are very nearly mainstream now (at least on desktops), so you shouldn’t worry about leaks or catastrophic failures. Unfortunately, this is actually a working concept that didn’t come to fruition. In contrast to traditional pad designs, the Opolar LC06 with its clamps mounts itself firmly to a laptop’s side or rear air vent and then rapidly extracts heat from there. This kind of vent is usually found on desktop-replacement and gaming notebooks. So having something like the Opolar should really help with overall heat dissipation. 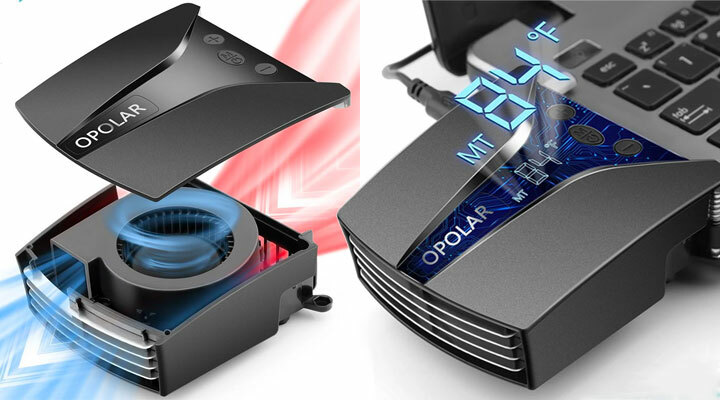 According to Opolar, its LC06 has the capability to lower a laptop’s temperature by 18 to 50F in just under a minute. What we like about this cooler is that there’s a Japanese-made fan motor in addition to 13 speed mode to manage airflow and noise. You can expect noise level of approximately 70db when the fan is operating at top speed. To top it off, a built-in LED screen reports back air temperature from a laptop’s vent in real-time. This DeepCool’s USB cooler – called U-Pal – is said to be inspired by the Arch of Constantine in Rome, Italy. Whatever you say, DeepCool. We don’t really see a resemblance between the two. Still, what we can easily tell the heavy-duty notebook cooler – designed for laptops up to 15.6″ – is highly customizable as it is functional. To begin with, there are 6 different ergonomic tilt angles, offering you more choices in viewing positions whether you are watching films or working. The supporting feet are made of steel so they are built to last. There’s also an anti-slip riser to hold the notebook in place should it angled too steep. The dual 140mm USB fan system running at 1000 rpm is capable of pulling in plenty of air to bring down temperature of a laptop under heavy-load by about 10C. Even if you don’t turn on the fans, the surface’s ventilated mesh can provide a certain degree of passive cooling for the notebook. The U Pal doesn’t seem to come with a power switch for the fans but it has a USB passthrough. Slim and stealthy like a Ninja, the TILT Stealth from Mad Minds has been imagined to help provide extra cooling for your 15″ MacBook Pro (non-Retina) and most importantly to protect you from toasted skin syndrome. It does so without affecting the trademark visual style. 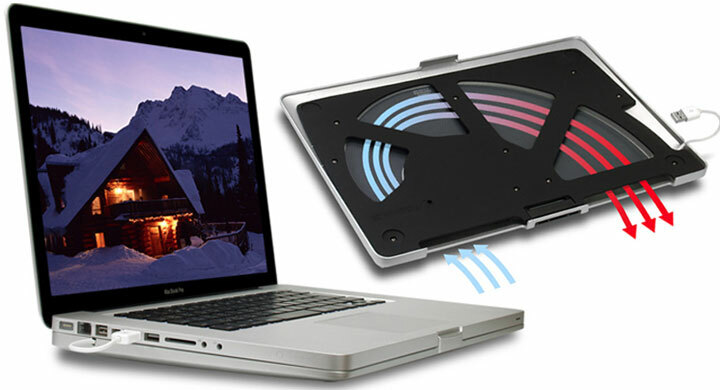 The tiny wedge locks easily to the bottom of your Apple notebook, providing extra airflow room under the hottest parts of the laptop, and additionally, a USB cable provides power to an internal fan that will dissipate heat faster. The stand, made of ABS plastic, is more of a shell that adds only negligible increases in height. In fact, the case is so thin that it should still fit in all but the tightest of laptop skins or cases. If you actually do any real work on your lap, you might never want to take it off. The TILT also includes a standard camera tripod-style connector increasing the options of where you can mount your MacBook in breezy style. Unlike typical notebook cooler designs which consist of one large cooling fan inside a plastic or metal frame, the Thermaltake GOrb II comes in two small plastic and rubber orbs which are inserted under the rear edge of your 10 to 17″ laptop. This is a striking departure from majority of other coolers. Thanks to their design, doing this tilts your laptop to a more ergonomic incline while allowing copious amount of airflow to the underside of the laptop. If passive cooling is not enough, the GOrb II comes with a 2200-rpm 70mm USB fan built into each orb. These 23CFM fans should allow more than enough airflow to keep even heavily stressed gaming notebooks cool. When not needed the USB cable winds back up inside one of the units. The GOrb II is perhaps one the most portable coolers we’ve seen. While laptop coolers are pretty much a dime a dozen, one characteristic they all share is the fact that they are not really self standing. 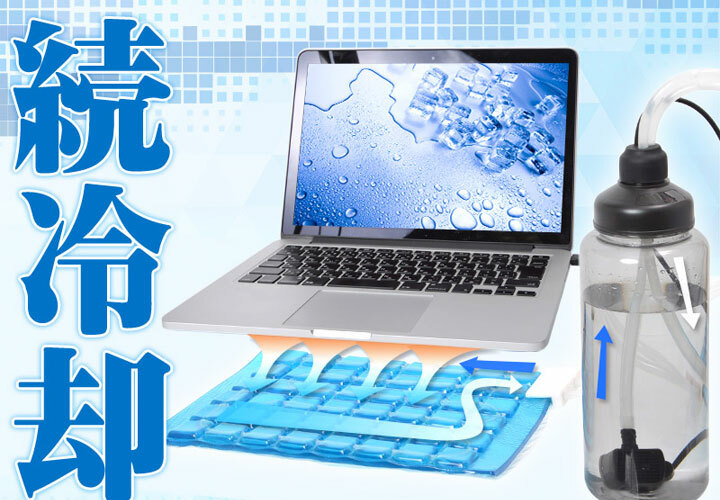 This appears to be the nifty idea behind the Thanko gadget as it really is a desk and laptop cooler all in one. As an added bonus, this cooler desk not only comes with an integrated fan powered off your laptop’s USB port, but the USB cable also provides data and power to an integrated 4-port USB hub. Additionally, it also comes with a USB LED lamp (which can also be powered by 4 AA batteries) and the whole works folds flat into about a 6cm, ultra-portable rectangular box, allowing for easy storage near anywhere. About the only thing missing is integrated speakers. Otherwise it really would be the perfect accessory for watching movies on your laptop while in bed. Here’s Cooler Master CM Storm Strike Force (SF-19 V2) – certainly an ambitious name for a notebook cooler. As it is aimed squarely at serious gamers, the SF-19 packs with dual 135mm USB-powered fans whirling at 1300 rpm with adjustable fan positions. While the fan noise could a problem, the ambient noise of the USB-powered fans should be much of an annoyance to you in the heat of a battle. CM Storm Strike Force sports strengthened mesh structure for notebook sizes up to 19″. 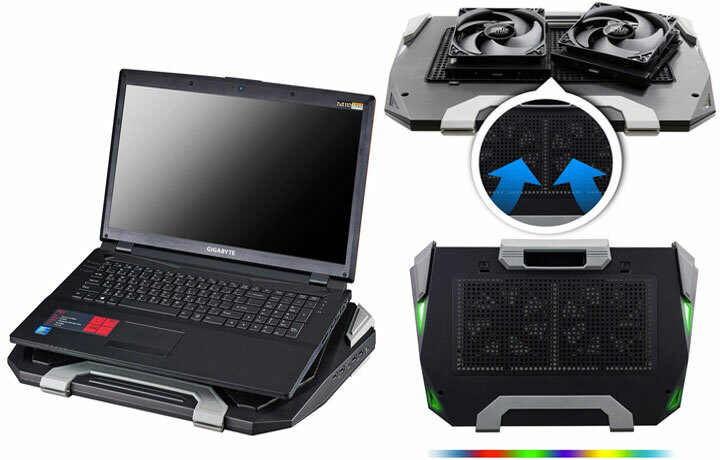 The cooler also coms with multi-light shader to produce ambient lighting depending on the gaming intensity. To top it off, it’s also the first laptop cooler to feature a carry handle and 4-port USB 3.0 hub which is backed by a 4A AC adapter. Combine all these together, prepare to add another 1.98kg to your carrying weight.